“Better luck next time,” sneers Tresa, holding the cup up to the light. An eerie sheen gleams on its surface. “It is a pretty thing, is it not?” she says. Jake eyes the half-dozen gun-barrels levelled at his chest. “You don’t understand what you’ve got there,” he says. Tresa hands the cup to one of the soldiers. “Put this in the plane and prepare for take-off,” she says. The soldier clicks his heels and runs off. She turns back to Jake. The cargo plane’s engines start up with a roar. Birds scatter from the nearby trees. Tresa starts towards the plane. Posted in Blog Posts and tagged Fortune and Glory, session report on May 9, 2014 by Tim. We now have the second of the expansions for Fortune and Glory. 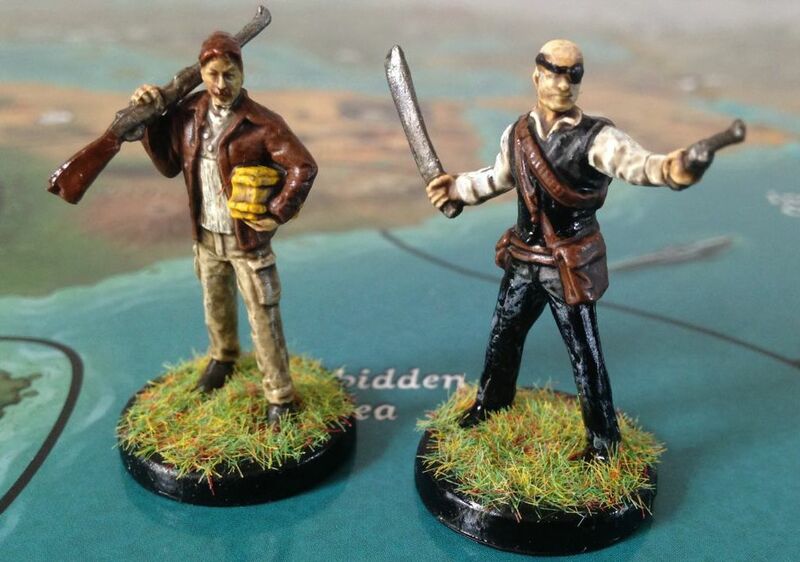 This is Treasure Hunters and contains four new hero characters to play. 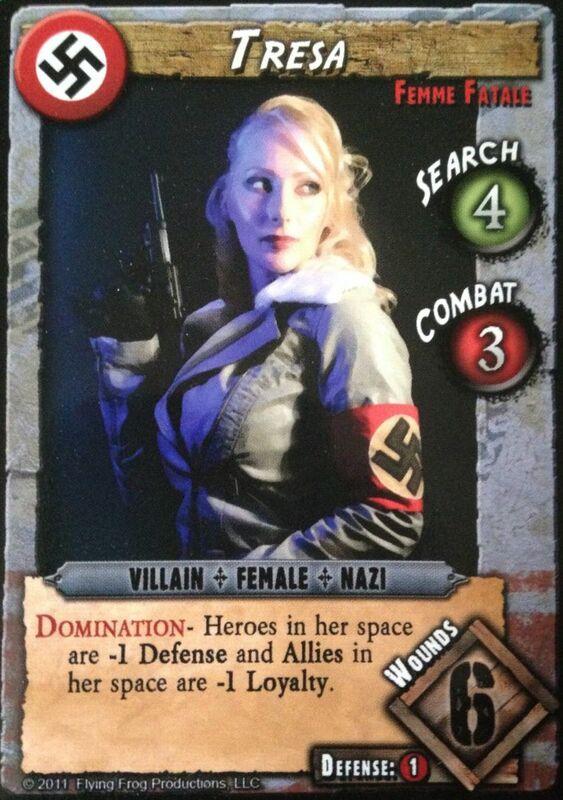 It also comes with new cards for all the decks and some new rules, including Personal Missions and the Docks. 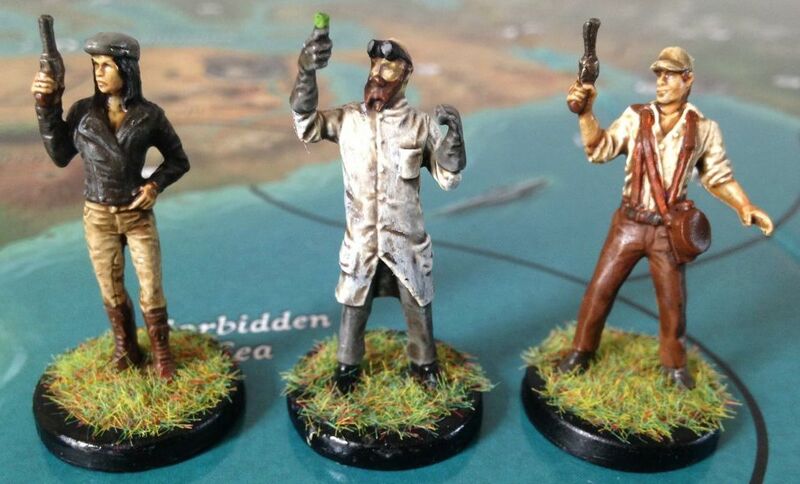 Posted in Blog Posts and tagged Expansion, Fortune and Glory, Treasure Hunters, Unboxing on May 7, 2014 by Tim. This is The Rise of the Crimson Hand, the first expansion for Fortune and Glory: The Cliffhanger Game. It adds a whole new faction of villains, the Crimson Hand, who are a cult threatening to take over the world. Posted in Blog Posts and tagged Expansion, Fortune and Glory, The Rise of the Crimson Hand, Unboxing on May 4, 2014 by Tim. Fortune and Glory: The Cliffhanger Game is the Indiana Jones-style adventure game from Flying Frog Productions. The title comes from the most famous quote from the Raiders movies, after the one about the snakes. It is set in the 1930s, and is a cooperative game where you are chasing the Nazis around the world after mysterious ancient artifacts. This has to be the biggest box game we own. It has a nice huge world map and a whole bunch of cards and figures. 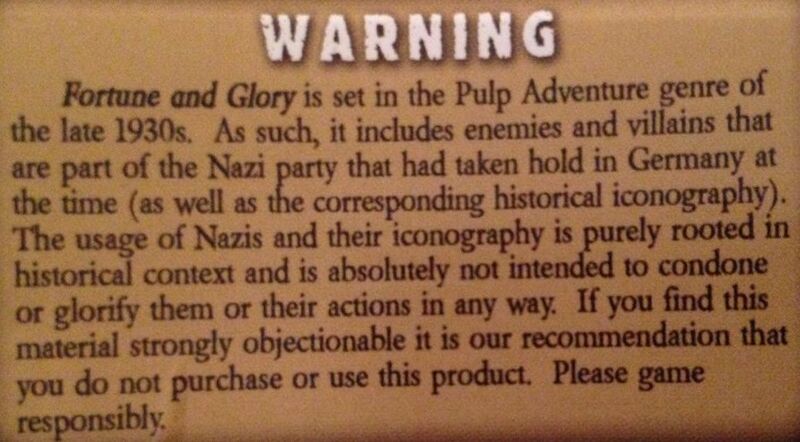 It is also the only game I have seen that comes with a disclaimer. We got it a while back and played it once. We found it a bit difficult to keep up with the villains. The game also suffered from ‘first play’ syndrome where I hadn’t got the rules straight. Gab loves it though. We call it ‘Nazi-opoly’. We have dug it out because we discovered it has two expansions. We now have the first of these, The Rise of The Crimson Hand. 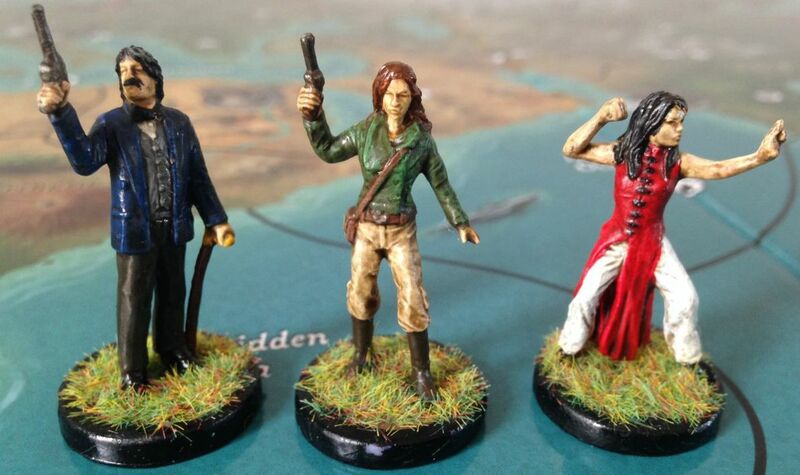 This is quite cool, as the Crimson Hand were the evil cult in the Touch of Evil board game, so they are still going two hundred years later. 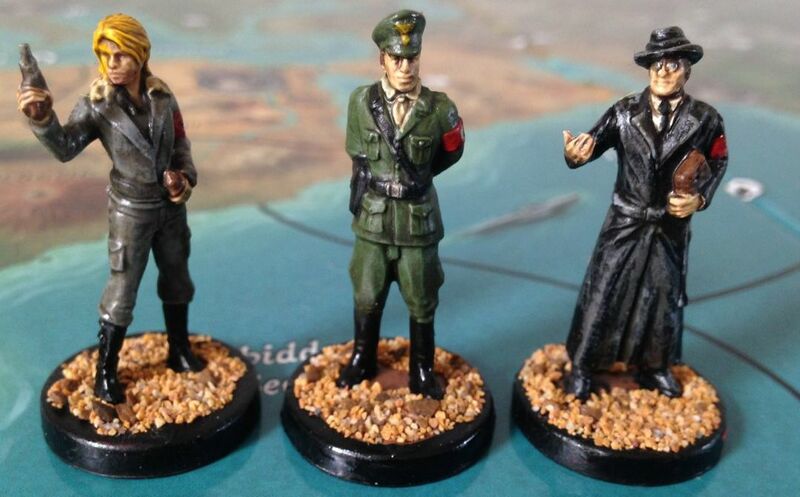 I haven’t painted the Nazi soldiers or the Mob villains yet, so along with the Crimson Hand they will make a nice painting project.